Home Costs > How Much Does a Home Sauna Cost? How Much Does a Home Sauna Cost? A sauna is a room that is commonly found in gym locker rooms and even in the home. This is a smaller room that has temperatures up to 150 degrees Fahrenheit, and the purpose of one is to promote sweating and relaxation, offering health benefits to those inside. On average, a sauna that fits less than four people can cost anywhere from $1,000 to as much as $4,000 without installation. The costs will depend on the brand, the type, the size, what extras are included and if professional installation is included. When installation costs are factored in, the average job should cost about $1,000, depending on how the sauna has to be powered. If it can simply be plugged in, then an electrician won’t be needed and the installation costs can drastically go down; however, if you were to require a new dedicated 220-volt line and piping running to the steam generator, then the installation job can get tricky, increasing the installation costs greatly. Even if you don’t have to hook up additional plumbing or electrical, you may still need help putting it together since it can come in various pieces, similar to furniture. The smaller saunas that fit one to two people cost anywhere from $1,000 to $4,000, and the average measurement for a two-person sauna is roughly four by four feet. An infrared sauna can cost anywhere from $900 to as much as $2,000. For example, the Ironman 2 Person Infrared Sauna retails for $950 to $1,200. Saunas that fit more than four people can cost anywhere from $4,000 to $9,000. Prebuilt infrared saunas at Costco, for instance, retail for $1,300 to more than $5,000. A portable sauna — which can be taken anywhere — can range from $150 to as much as $500. Outdoor sauna kits ready to be put together can cost $5,000 to $9,000; again, depending on the factors mentioned above. According to Celebration Saunas, the average purchase price alone will be $1,500 to $2,500 for a two-person sauna to as much as $15,000 for a six person sauna. This will all depend on the brand, size, quality of construction, the materials that were used and the energy rating. A traditional sauna will be the most common sauna found inside a household and will typically use an electric heating element that produces steam when water is poured over the volcanic rocks. It can also come in gas or wood-fired versions; however, these types aren’t common. An infrared sauna will use infrared energy to heat your sauna, and unlike the traditional sauna, no steam will be produced, making it comfortable for those who don’t like the steam aspect. This sauna will use less energy and will be much more efficient. A steam room will use a dedicated steam generator and will produce a humid-like environment with a lower temperature. When purchasing, you will commonly see two terms being used: precut sauna kits and modular prebuilt. A precut sauna kit will require that you provide the wall studs, insulation and the exterior walls, and with this kit, you will be able to build the sauna from the prebuilt pieces. Inside the kit, it will commonly include wall and ceiling boards, benches, a pre-hung door, flooring, a heater and a number of accessories, ranging from a backrest to vents. All brands will vary. A modular prebuilt sauna will make up for close to 90 percent of all sales and will include everything you need in order to erect it. Even if you’re not handy, one can be built in less than a day if the directions are followed closely. These kits will be two-sided and the walls and ceilings will lock together. All of the accessories, such as the flooring, benches and backrests, will come preassembled. Common sizes, as stated above, range from a four-by-four to an eight-by-eight and ceilings will be seven feet tall to minimize heat loss. Larger sizes can be accommodated but could be harder to find on the market and may have to be custom made, leading to a higher price tag. Most will be made from a cedar wood due to its ability to absorb steam and keep a relatively cool atmosphere, making the room more comfortable. While most won’t have windows, the door may be made clear or opaque glazed to offer an open feeling. Larger saunas will often have two benches at varying heights. One will be about 36 inches tall, while the lower bench, which can act as a step or even a footrest, will sit about 18 inches off the ground. An electrician may be required in order to hook up a new 220-volt circuit if required to hook up the electrical unit. A plumber may be required as well if you choose a steam room since it will need a dedicated water line hooked up to the steam generator. There are other accessories available that are not included when you will buy a sauna such as a thermometer, headrest and wooden bucket with a ladle. All of these accessories are relatively inexpensive and won’t cost more than $20. Other optional accessories may include a sound system to allow you to play music ($500~), an air purifier ($200), air ionizer ($200), aromatherapy dispenser ($200) and colored lights ($150 each). Also, some buyers often find themselves changing the interior and doors to suit their home’s style. If this were the case, changing the door and interior, depending on what’s being done can cost upwards of $500 to $1,500. Companies online may charge an additional freight shipping charge due to the weight. Due to the electricity that the sauna uses, do not be surprised if your electric bill is an additional $10 to $55 per month; on average, it should cost about $1 every time you use it. 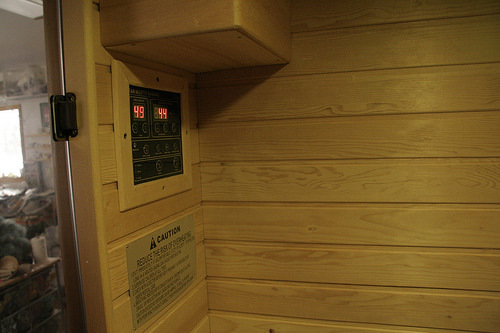 Infrared saunas will be a lot cheaper to run since they will use less power because they heat surfaces, not the air. These saunas also have a lower preparation time, which means it can be ready in as little as a half hour when compared to a traditional sauna that can take up to an hour to heat up the room. While it’s not necessary, many opt to purchase a sauna suit in order to keep their body warm and limber while in the sauna. These suits usually range from $8 to as much as $40. When planning space, allow at least two feet between each bather. If you need to have the sauna professionally installed, it is wise to get at least three quotes. Consider using websites such as HomeAdvisor.com to get quotes from multiple contractors in your area. For those who have “handy” skills, DIY sauna plans are available online. By building your own, this could cut the costs down by a few hundred or even thousands.